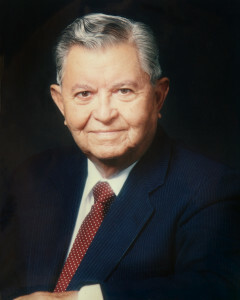 Benjamín Cantú (1913 – 1998) was the fourth Bishop President of the Apostolic Assembly. He was the first Bishop President born in the United States. Cantú was born in a Methodist family on February 20, 1913 and was a zealous Trinitarian preacher until he was filled with the Holy Spirit to his surprise at an Apostolic service. Minister José Guerra baptized him in 1931. His pastoral ministry began in Mission, Texas and his wife was our sister Tomasita Saenz whom he married in 1935. During these first years he rose as the natural leader to South Texan Apostolic churches and in 1933 he connected these churches with the “Iglesia Apostólica”. In 1937 he led these Texan churches to work with their counterparts in California. He was appointed Elder for all the state of Texas. Bishop Cantú was a gifted preacher, eloquently commanding both English and Spanish. At the death of Pioneer Bernardo Hernández, he succeeded him as General Secretary. Being an effective administrator, the pastors elected him Bishop President in 1950. The hallmarks of his presidency include the creation and expansion of the Apostolic Assembly’s missionary program, the Department of Christian Education and the first Expositors. Bishop Cantú composed “Cristo es Nuestro Jefe,” and “El Pionero Predicador.” He died July 28, 1998 as Pastor of Emmanuel Apostolic Church, a church he began in downtown Los Angeles.